Analyzing cellular populations within specific anatomies in brain images requires expertise in both neuroanatomy and cellular identification. This typically involves a scientist comparing experimental images with a reference atlas and manually delineating anatomical regions and marking cell populations within. NeuroInfo®, a revolutionary new technology from MBF Bioscience, enables researchers to automatically identify and delineate mouse brain regions based on the publicly available Allen Mouse Brain Reference Atlas. 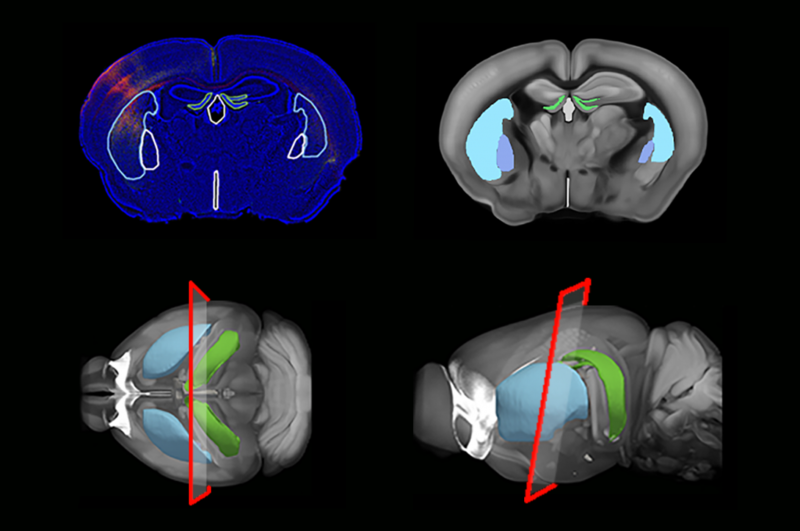 “The Allen Mouse Brain Reference Atlas is a valuable tool to assist scientists in their research. We’re thrilled that MBF has chosen to integrate this resource into NeuroInfo,” stated Amy Bernard, Ph.D., Product Architect at the Allen Institute for Brain Science. “Using this remarkable technology, neuroscientists will obtain more repeatable, objective analyses that have been possible to date. Thanks to the integration with the Allen Mouse Brain Reference Atlas, these analyses will be more standardized so that they can be compared across experiments and laboratories,” says Jack Glaser, President. NeuroInfo can be used with MBF Bioscience’s slide scanning software and virtually all commercial whole slide scanners. The data from NeuroInfo seamlessly integrates with MBF Bioscience’s products including Neurolucida, Stereo Investigator, Biolucida, and BrainMaker. The tools in NeuroInfo allow researchers to automatically delineate anatomies in the experimental specimens, and detect cells within these anatomies. NeuroInfo yields data that can be invaluable to better understand the organization and composition of the nervous system, and to further knowledge in neurogenomics, transcriptomics, proteomics, and connectomics. The National Institute of Mental Health provides funding to support the development of NeuroInfo. Posted in MBF Company News, Software and tagged Allen Institute, neuroinfo, press release.